Irène Joliot-Curie (*12 September, 1897, † 17 March, 1956) was a French scientist. She was a daughter of Marie and Pierre Curie and later the wife of Frédéric Joliot-Curie. Irène Joliot-Curie together with her husband was awarded the Nobel Prize for Chemistry in 1935 for their discovery of artificial radioactivity. 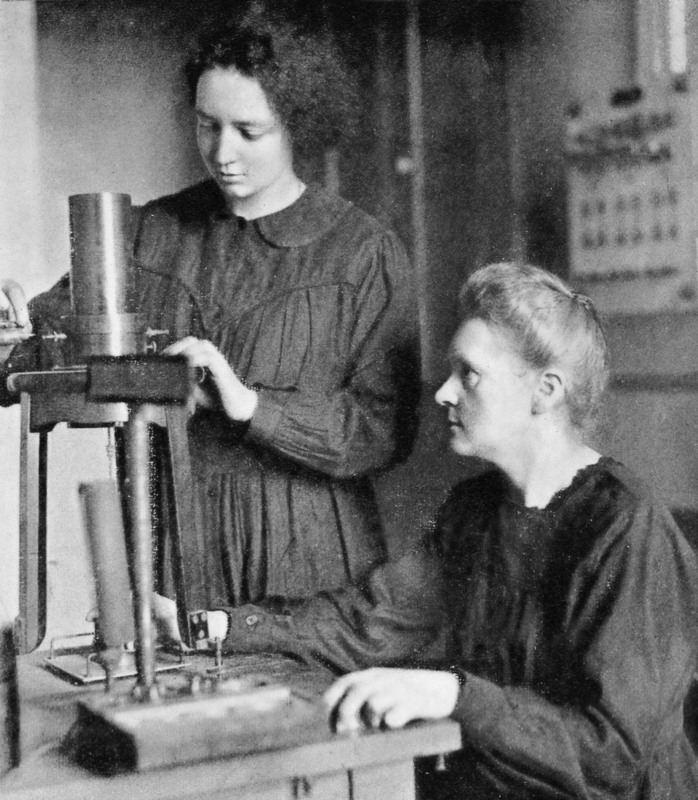 Irène Joliot-Curie was the oldest daughter of Marie and Pierre Curie. When she was eight years old, her father died. Therefore she grew up under the care of her grandfather Eugène Curie. Initially Irène received a traditional school eduction. However, to foster the talents of their children Marie Curie and befriended scientists organised a learning cooperation, where they teached their children on their own. During the First World War Marie Curie organised mobile field hospitals with X-ray equipment. At first the 17 year old Irène helped her mother as an assistant, but later on she became head of the X-ray station at the military hospital in Amiens. In addition to that she studied mathematics and physics at the University of Paris and graduated in both subjects in 1920. After the war she worked at her mother's Radium Institute, where she met her later husband Frédédric Joliot. They married in 1926, one year after Irène Joliot-Curie did her doctorate. In 1927 their first child, Hélène, was born followed by their son Pierre in 1932. In 1934 Irène Joliot-Curie together with her husband discovered the possibility of creating radioactive materials quickly, cheaply, and plentifully. This discovery earned them both the Nobel Prize for Chemistry in 1935 and the recognition from the scientific community. In 1937 she received a professorship at the Sorbonne. Between 1951 and 1954 she applied for a chair at the Academy of Science several times to break the Academy's mysogynist tradition, but each time was rejected. The working with all the radioactive material over the years caught up with Irène Joliot-Curie and she was diagnosed with leukaemia. In 1956 she was admitted to the Curie hospital in Paris, where she died on March 17 at the age of 58.